Be the first to know about exhibitions and events at the Getty Center and the Getty Villa, and the work of the Getty programs, with our e-newsletters and e-alerts. Subscribe by completing the information below and selecting the checkbox(s) next to the e-newsletter(s) you would like to receive. Be sure to click on the Submit button at the bottom of this page after you have made your selections. You can unsubscribe at any time by following a link at the bottom of the mailings that you receive. 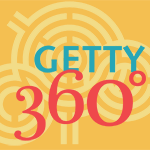 If no boxes are checked, you will be signed up for "Getty360." By submitting this form, you agree that we may use this information to send you the requested publication, and to share Getty information with you that may be of interest. We will not share your contact information with anyone except as necessary to deliver this publication and information. Learn about new exhibitions and highlights of upcoming events, including performances, lectures, courses, and family activities at the Getty Center and the Getty Villa, and get periodic special offers and discounts. Sent once a month, with additional announcements mailed periodically. Offering in-depth information about the Museum's collection, exhibitions, and public programs, and providing you with new insights and a behind-the-scenes look at the world of the Getty Museum. Sent quarterly. The bulletin complements Conservation Perspectives, The GCI Newsletter, the Institute's print newsletter, focusing closely on GCI activities and providing more timely information to our professional colleagues around the world. Sent every two months. Stay connected to the Getty Foundation. Each quarter, we share stories highlighting our current initiatives and recent grants. Sent every three months. Stay informed about the Getty Research Institute's exhibitions, publications, public events, lecture series, and seminars. Learn about new resources and collections, view digitized materials, and watch videos of GRI events. Sent once a month. Learn about programs at the Getty Villa that explore the cultures of the ancient Mediterranean, including lectures, conferences, and symposia, as well as other scholarly events, exhibitions, and performances. Sent once a month. Our online store features unique gifts for everyone, including Getty Exclusive products, a comprehensive selection of Getty Publications, exhibition related items, jewelry and handcrafted decorative objects. Sign-up to receive notifications of new arrivals, private sales and special offers. Sent weekly.